30 July 2007 (New Straits Times) – It looks like it’s another artifact sale in Malaysia, from remnants of shipwrecks in Malaysian waters. These artefacts are left over from archaeological salvage and come from a variety of shipwrecks. I’ll be headed up to KL this weekend, and so I hope to write about the sale there. TREASURES from the deep go on display and sale in Kuala Lumpur this week at an art fair that showcases an array of Asiaâ€™s treasures from the 11th to 19th centuries. 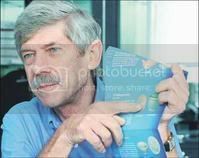 And the man who spent 17 years plumbing the depths of Southeast Asian waters, discovering 10 major shipwrecks, is marine archaeologist Sten Sjostrand. Sjostrand is proud of his underwater feats and retrieval of precious artifacts: he will have these remarkable pieces showcased at the Asia Art Fair 2007, also an exhibition comprising Asian collectibles and treasures, which opens at the Bangsar Shopping Centre, Kuala Lumpur, tomorrow. The pieces retrieved from the shipwrecks may not be the most aesthetically pleasing in a conventional way or most colourful, but they are definitely timeless treasures that are intriguing and mysterious. Historical artwork has been carved and fired on to these items ranging from ceramics, pottery, ornaments, accoutrements to utensils. They were found on the shipwrecks from the Tanjung Simpang (the years of 960-1127), Turiang (1370), Nanyang (1380), Longquan (1400), Royal Nanhai (1460), Xuande (1540), Singtai (1550), Wanli (1625), Anantes (1795)and Desaru (1830). Most of these pieces were the objects of trade between China, Vietnam, Thailand and Malaysia. However, itâ€™s the Wanli shipwreck that will be the main feature because of the familiar designs of 17th century Chinese porcelain artwork. It signified the time when European merchants were involved with Asiaâ€™s maritime trade and were supplying their domestic markets with Asian products. Read more about the Malaysian shipwrecks artefact sale. 12 July 2007 (New Straits Times) – Lucien de Guise, curator of the Malaysian Museum of Islamic Arts, writes a column about the sale of shipwreck treasures in Malaysia. JUST in case anyone thought that the last discussion about fakes was the end of the series, it was actually the beginning. My email inbox is once again filling up with opportunities to detect the bad boys in a ceramics collection. A short time after Peter Lam came from Hong Kong at the request of the Southeast Asian Ceramic Society to talk about “Detecting the Fakes”, we now have Roxanna Brown of the Southeast Asian Ceramics Museum of Bangkok giving her expertise on ceramic dates. In addition, there is Sten Sjostrand on the subject of “How to Identify Real Antiques from Fakes”. Itâ€™s no wonder Malaysia is so interested in fakes. The nation is Public Enemy Number One in the all-round piracy league table, after China of course. On a per-capita basis, Malaysia is a clear winner. It seems that the word “fake” has an irresistible attraction. If the talks were called “Kiln Technology of the 16th Century”, the turnout would be comparatively small. Issue a proper challenge, such as identifying fakes, and the people will beat a path to your lecture hall. A bigger challenge is getting collectors to take an interest in the things that are being faked, including shipwreck ceramics. Nobody has tried harder than Sten Sjostrand. Facing the angry seas, he has recovered countless sunken cargoes and the barnacles that come with them. He has lectured endlessly on the subject, staged exhibitions and recently co-written a book. Taking things to another level, Sten has introduced a subliminal message. Sharp-eyed visitors to Aquaria at KLCC will notice that there is more to look at than the fish. There are fragments of old Chinese ceramics littering the floors of the Aquaria tanks. There canâ€™t be many fish tanks in the world that use genuine shipwreck parts from half a millennium ago. Malaysia is the last place you would expect to find anything so authentic. Some of the fish may look like they are dead or clockwork, but the bits of broken pottery are the real thing. They are also for sale, or at least some closely related items are. You donâ€™t need to be so sharp-eyed to spot the stall selling these wares on your way out. Read the full editorial, Missing the boat on shipwreck treasures. 4 December 2006 (Bernama) – A feature on one of the shipwrecks in the South China Sea, the Wanli, which was excavated by Nanhai Marine Archaeology. In year 1625, a Portuguese vessel set off from China on a voyage to the Straits of Melaka. Onboard were tonnes of chinaware and pottery that would bring lucrative profits for the Portuguese. However, the ship now named “Wanli” never reached the Portuguese fort of Melaka as she sank half way sailing through the South China Sea. The ill-fated voyage of Wanli remained a mystery until almost four centuries later when her wreckage was discovered buried deep in the ocean off the coast of Terengganu together with her precious cargo. It’s the first SEAArch podcast! We go on-location to the Aquaria @ KLCC, in Kuala Lumpur, Malaysia to bring you a first-hand look at the Treasures of the South China Sea exhibition, on now until the end of this month. Please leave comments and feedback! It’s a hazy day in Kuala Lumpur, and we are on our way to the KLCC where the famous Petronas towers are standing. The Petronas towers are currently the tallest buildings in the world, but weâ€™re not going up the towers today, instead we are heading underground and back in time. The Treasures of the South China Sea exhibition at the Aquaria is a rare chance to get up close and personal with artefacts dating as far back as one thousand years. Organised by Nanhai Marine Archaeology and supported by the Malaysia Department of Museums, the exhibition showcases artefacts retrieved from ten shipwrecks found in the waters of Malaysia. In chronological order, the ten shipwrecks are: The Tanjung Simpang, Turiang, Nanyang, Longquan, Royal Nanhai, Xuande, Singtai, Wanli, Anantes and Desaru. The wrecks are named arbitrarily, sometimes named after their present locations and at other times named after some characteristic feature. They date from the 10th century right up to the 19th century and cover the Chinese dynasties of Song, Yuan, Ming and Qing. Most of the pieces in the exhibition are on sale and collectors interested in owning a piece of history might be interested in buying a gong, a bowl or a pair of spoons from the Desaru shipwreck. For my part â€“ and my meagre budget â€“ I got a miniature celadon jarlet retrieved from the Royal Nanhai wreck that dates to around 1450. I also bought a book on Malaysian Shipwrecks. The company behind the retrieval of these artefacts, Nanhai Marine Archaeology, works very closely with the Malaysian Department of Museums. Sten Sjostrand, the principle investigator and founder of the company sees himself as a marine archaeologist rather than a treasure hunter or antique dealer. Unfortunately, I didnâ€™t have a chance to speak with him when I was there, but from what I hear, heâ€™s really passionate about his work and so hopefully we can hear from him in another podcast. The Museums Department gets its choice of artefacts and 30% of the retrieved finds, and the remaining 70% are sold by the company. The money raised is used to fund future marine expeditions. This exhibition is special, however, because it may be one of the last ever and so if you have the time, you should make the trip down because Mr Sjostrand is said to be retiring. The Treasures of the South China Sea Exhibition is on at the Aquaria at KLCC until the end of October. For more information, you can visit Nanhai Marine Archaeologyâ€™s website at www.mingwrecks.com and donâ€™t forget to visit the SEAArch website at S-E-double A-R-C-H dot wordpress dot com for a full transcript of this podcast and more news and resources on the archaeology of Southeast Asia. Music for this podcast was by Gamelan Nyai Saraswati from the University of North Carolina at Chapel Hill. You can send your comments, feedback and suggestions to seaarch@gmail.com. Until next time, this is Noel signing off for the SEAArch podcast. 7 October 2006 (The Star) – Liz Price covers the sale of excess finds from shipwrecks in Malaysian waters at the Aquaria in KLCC. Watch out for the podcast coming soon! How would you like to be the owner of a 1,000-year-old piece of pottery recovered from the Malaysian seabed? Thousands of such treasures are on sale in Kuala Lumpur in a month-long exhibition. Treasures of the South China Sea at Aquaria, KLCC shows pottery and ceramics recovered from 10 shipwrecks found in Malaysian waters, and all the pieces are up for sale. Rest assured that you are buying a genuine piece, as its origin and history are known. Items include Ming dynasty celadon dishes, vases, Sukhothai fish plate, porcelain ewers, Qing dynasty blue and white dishes, brown glazed jars, covered boxes and jars, teapots, bowls and spoons. There are even 1,000-year-old bronze gongs. 13 September 2006 (Bernama) – A marine archaeologist is retiring with a bang! Sten Sjostrand of Nanhai Marine Archaeology Sdn Bhd is having a sale of artefacts collected from nine shipwrecks over 35 years. Nanhai made the news a couple of months ago by recycling their ceramic finds as jewellery. A large number artefacts recovered from nine historical shipwrecks off the coasts of Malaysia, spanning more than 1,000 years, will be on display and put up for sale at Aquaria, Kuala Lumpur Convention Centre here next month. Sjostrand, who is passionate about his work, said he would not be a mere antique dealer at the sale and exhibition but also a marine archaeologist, a profession that was unheard of in the country before, giving guided tours to visitors to the exhibition. The complimentary guided tours will be held at the multi-purpose hall of the Aquaria every Friday, Saturday and Sunday at 2pm and 5pm. Sjostrand, who hinted that the sale of the Chinese artefacts would probably be his last in this country before holding a small auction in China and then retiring in Bahamas, felt he had done his part to serve this country by giving on-site training to local museum personnel on marine archaeology throughout the years.